If you missed their 3 day SALE, this is your chance. 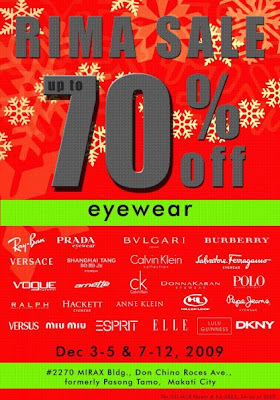 Up to 70% off on all eyewear: Ray-Ban, PRADA, Bulgari, Burberry, Versace, Shanghai Tang, Calvin Klein, Salvatore Ferragamo, Donna Karan, Polo, Ralph, Anne Klein, Pepe Jeans, Versus, Miu Miu, Esprit, ELLE, Lulu Guiness, DKNY. Timex watches, Van Heusen and IZOD. #2270 MIRAX Bldg, Don CHino Roces Ave. (formerly Pasong Tamo), Makati City.